The hits just keep on coming this weekend. Today I had the distinct pleasure of presiding at the wedding ceremony of a beautiful young couple, who tonight are now Mr. & Mrs. Tyler Ward. Maria is the daughter of a permanent deacon who is the Director of Pastoral Ministries for the Diocese of Cheyenne. Tyler’s parents are active in the Cheyenne. Tyler and Maria are both Catholic, and the faith-filled nature of their ceremony today gives me great hope. Congratulations to Maria and Tyler Ward! Below is the homily for the occasion. 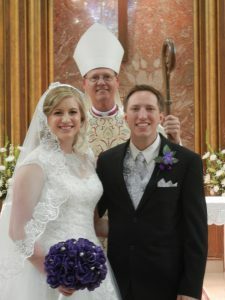 Maria and Tyler, the readings you have selected for today’s Mass are unique, in that they are not the usual choices. I’m sure this uniqueness of the readings reflects your own uniqueness among young adults today. Clearly, God has blessed you both with families of faith, friends of faith, and a deep faith of your own. I hope you never take such gifts for granted, and that you not only give thanks to God, but nourish the gift of faith that is yours. The second reading today speaks of how we live our life as a gift. St. Paul instructs us that we are to live as Christ, which is “to live in love, as Christ loved us and handed himself over for us as a sacrificial offering to God.” (Ephesians 5:2) Your love as husband and wife is a reflection of the highest dignity of humanity, in that it is a true reflection of the image and likeness of God. The first reading today from the book of Tobit recalls the teaching of the book of Genesis which says: “God created mankind in his image; in the image of God he created them; male and female he created them.” Being created in the image and likeness of God has little to do with our physical makeup. Bearing the likeness of God means we are created for love, we are created for communion; we are created for giving and receiving love in a harmonious and fruitful fashion. Being created in God’s image and likeness means we participate in the Divine love and truth. The Divine relationship of Love is at the core of our being, longing to be expressed in authentic human love. This authentic human love as lived and expressed by a husband and wife shines a light of life and hope into the world. This spousal love is salt to the human family because it is the shelter from the storms of life, healing for the wounds of life, and the font of new life itself. Daily fidelity to authentic love is challenging. That is why there are so many marriages that fail and why there are so many broken homes today. Somehow our society has bought into a notion of fairytale love; a love that is only and always bliss. However, there is nothing in the history of salvation that gives such a notion of love. Christian marriage must always be rooted in God, rooted in the redeeming love of Jesus Christ, sustained by the inspiration and fidelity of the Holy Spirit. Because we live in a fallen world, there will always be a certain amount of imperfection to our love, a certain part of the human heart that will only be reached by the perfect love of God. But we have the courage to enter into a promise of life-long love because we know we need the mercy and love of God in our life. A short reading of the Psalms or even of the reading today from Tobit, tells us that life has its ups and downs, but God is with us in every moment. Just because there are trials, even occasional failures in love, is no reason to call it ‘quits.’ Rather, these are precisely the moments to realize that we cannot make it on our own steam, and we need to turn to God to provide what is lacking. This is precisely how Tobiah and Sarah begin their married life, by turning to God in prayer, asking God to keep them safe from the forces of evil. They ask for God’s mercy and blessing. They acknowledge God as Creator of all, and ask that he bring forth children from their love. (Tobit 8:4-8) Clearly, the forces of evil facing Tobiah and Sarah were great, because while they slept through their wedding night, Sarah’s father was digging a grave for Tobiah, fully expecting he would not live to see the light of a new day! (Tobit 8:9) Perhaps if we were as realistic about the forces of evil facing us today, we would turn to God more regularly than we do. Finally, Maria and Tyler, as your bishop, I thank you for your faith and for choosing to seal your love in the Sacrament of Holy Matrimony. The Church needs you today. We need your willingness to live in love and truth in the midst of our society, as well as in our Church. Your love and faith lived in truth for all to see is indeed keeping Christ’s instruction to be the salt of the earth and the light of the world. With every vocation comes a commission which shares in the great mission of the Church, to proclaim the Good News. First and foremost, this work of yours will take place within your home, and please God will involve raising children in the faith. However, a very big part of the work of new evangelization today belongs precisely to young people such as your selves living as a leaven in the world. By your faith and love, you will attract others to yourself. Some may already know Christ, but declare themselves to be among those who need no organized religion. Others may not yet know Christ, but will be drawn to him through you. Both groups, you are to lead by the light of truth and love into the heart of Christ, which is the Church. No matter where God’s will leads you, no matter the difficulties, know that God is always with you, and very pleased with you and your love. May your love always be a beacon of Christ’s love for the Church, and may that love always be willing to embrace others in his holy name. God bless and keep you in love all the days of your life!